Banana Bread is a favorite in this house. Ok, closely followed by cheesecake for me personally. It is not too sweet, hearty, with a bread-like texture (I know, that’s why the name). It can be topped with any kind of extras, from indulgent frostings to protein-packed nuts and seeds, or enjoyed just plain, with no toppings at all. You can eat it for breakfast or as a snack in between. No need for a special occasion to have a slice but it can be the highlight to celebrate a special occasion. I like trying out and modifying new banana bread recipes, experimenting on how to make it healthier and more nutritious, with a new tasty twist. So this recipe right here is a winner. This grain-free banana bread is made with coconut flour, four (yes, …4) ripe bananas, four eggs (did anybody say more protein? ), coconut oil, warming spices like cinnamon and nutmeg, vanilla extract plus a pinch of salt, baking soda + baking powder. Where is the sugar? No extra sugar. All the sweetness comes from the bananas, fully natural. This part makes me dance. 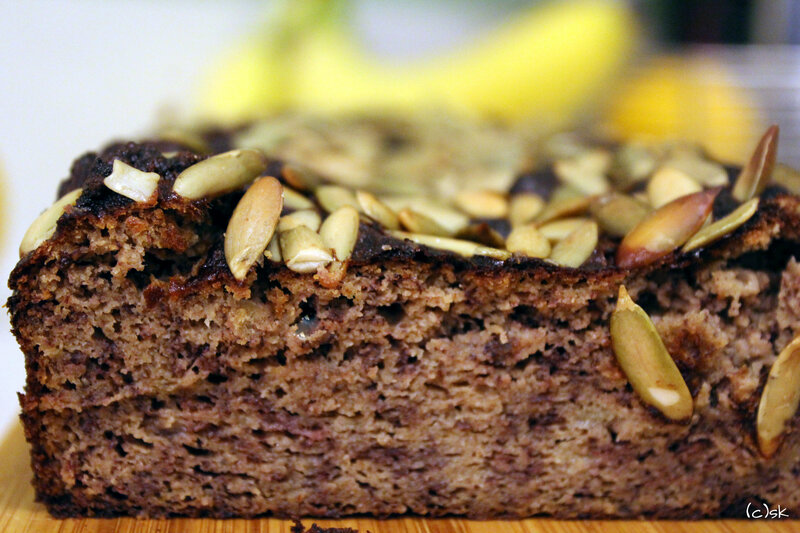 Once baked you have a spongy, moist, slightly sweet and very tasty banana bread. And if you top it with pumpkin seeds before baking it in your oven, it will add a nice crunchy bite to it packed with protein and iron. Optional for some extra protein and added nutty flavor: Add half a cup of almond butter into your batter before baking.